Coming to work in Fort McMurray? Lobster suppers are extremely popular in Charlottetown and the surrounding area. Whether you want to dine in a restaurant, prepare it yourself or eat it on a boat or the beach, you have numerous options to choose from. Let’s get started! Water Prince Corner Shop and Lobster Pound, which is located on the corner of Prince and Water streets, has been owned and operated by the same family for over 20 years. They pride themselves on serving fresh lobster and other seafood, delivered to their door by local fishermen. The menu is simple but authentic. It simply referred to as “plain good food.” Lobster dinners and lobster rolls continue to be two all-time favourites. You have the choice of dining inside or on the patio. Should you choose the latter, you just might get lucky enough to find a table with a wonderful view of the waterfront. Alcohol is served and reservations are recommended. 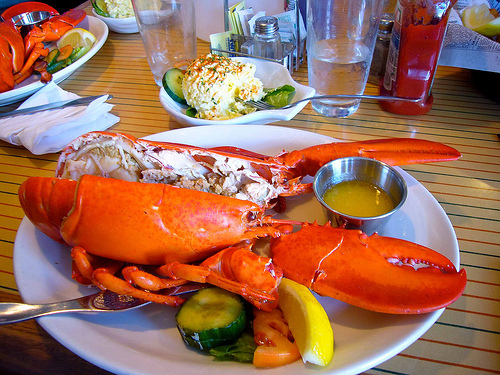 Lobster on the Wharf has been serving hungry visitors and residents, from May through October, since 1986. Conveniently located on Prince Street in Charlottetown, it’s the ideal place to go for a delicious lobster dinner. The restaurant was rebuilt in 2003, after sustaining damage from Hurricane Juan. It currently seats 240 indoors and 110 outdoors. The dining room is built out over the water. As you might guess, there are several lobster entrées on the menu. This includes a traditional lobster dinner, a lobster feast for two, lobster macaroni and cheese carbonara, lobster and steak and “lazyman’s lobster,” which doesn’t require any work on your part before you eat it. The majority of these entrées sell at market price. So, when the lobster is most plentiful, you get a delicious meal and save money at the same time. Lobster on the Wharf also serves a wide variety of other types of seafood, as well as “land lover” dishes. They have a children’s menu, created especially for the younger set. If you prefer to prepare your own lobster, you have the option of purchasing it live from the adjacent lobster pound and taking it with you. This is a great choice if you feel like having a party on the beach. Whether you choose to eat inside the restaurant or on one of the decks for a better view of the water, reservations are recommended. If you’re feeling more adventurous, why not take a lobster tour? It’s easy to charter a boat from a company such as Top Notch Charters and Lobster Tours, which is in operation from July 1 until the end of August. This is the best way to learn everything you’ve probably always wanted to know about lobsters. You’ll learn about the modern technology that’s now used to trap lobsters. You also get the opportunity to take a turn at the wheel and band a claw just like a real fisherman. At the end of the trip, you partake in a traditional lobster supper with all the trimmings. It’s a great way to observe other types of sea life and learn how a fishing family earns their living. Choose to sail on the 45-foot boat either in the afternoon or the evening. The charter is suitable for everyone from couples to families or groups of up to 12 people. This keeps the experience as personal and memorable as possible. Each excursion, with dinner included, lasts approximately 2.5 hours. When you visit the Claddagh Oyster House on Sydney Street, you’ll feel like you’re visiting a pub in Dublin. Open in 1983, the restaurant has been serving lobster and other seafood delicacies for over 30 years. Some of their menu items include crispy lobster crab cakes, fisherman’s stew, Island lobster risotto with white wine and fried herbs and fresh lobster that you choose right from their tank. While you’re there you might want to try one of the many oyster appetizers that the restaurant is so famous for. Reservations are recommended. If a fine dining experience is what you’re looking for, you won’t want to miss eating at Lot 30 in Charlottetown. This is also an excellent choice if you happen to be more of a history buff. These are just a few of the many choices you have, when you’re craving fresh lobster in Charlottetown. Upon arrival, you’ll soon learn that the majority of restaurants in the area serve some type of lobster dish. The city is truly a seafood lover’s paradise. Enjoy your stay and don’t forget to pack your lobster bib!